Metal-ceramic restorations are extensively used in prosthetic dentistry as a restoration of choice. Desirable properties of metal-ceramic restoration such as biocompatibility, excellent abrasion resistance, color, and dimensional stability contributed to the popularity of this esthetic veneering material. At the same time, metal-ceramic restorations faced the problems such as the grayish discoloration at the margins of the restorations, chipping of the porcelain, allergy to the metal, difficulty in shade matching, especially in the anteriors due to the opaque metal beneath, and the high cost of nonprecious metals. To overcome these problems, the all-ceramic restorations were introduced. All-ceramic restorations gained popularity because of its improved physical and esthetic properties and clinical success. 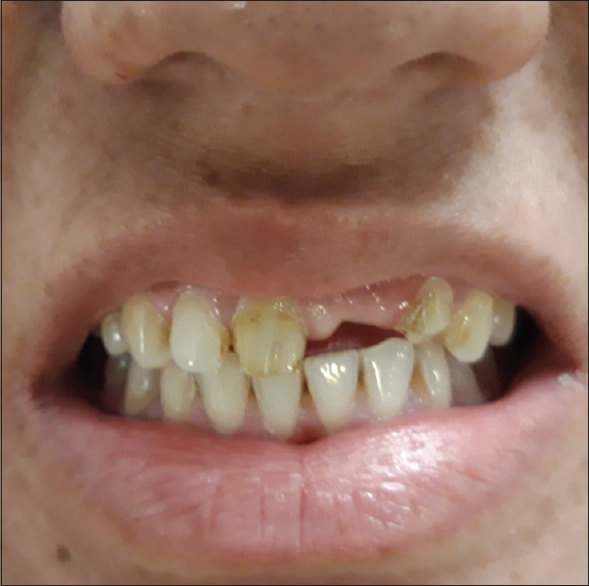 This case report describes a prosthodontic rehabilitation of a patient with missing anterior tooth with a zirconia-based all-ceramic bridge restoration. 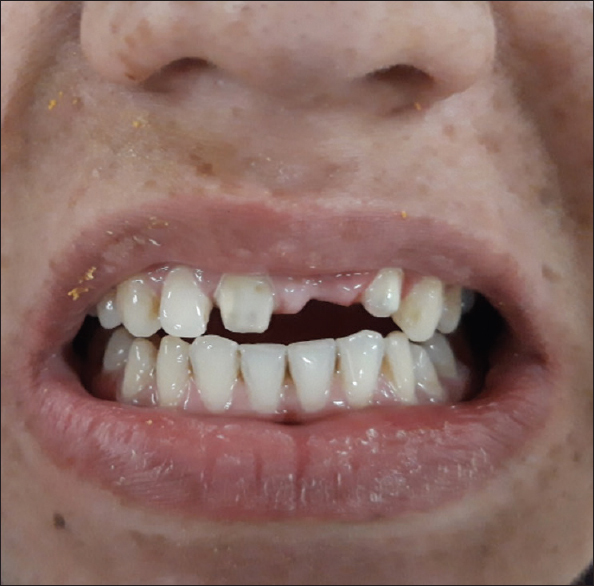 An 18-year-old young female was referred to the department of prosthodontics and crown and bridge with a chief complaint of poor esthetic appearances due to missing upper front teeth. Intraoral examination showed missing 21 [Figure 1]. The patient gave a history of trauma 6 months back. Radiograph revealed root canal treatment with 11 and 22. The patient reported with a dislodged bridge with 11, 21, and 22. The present prosthesis was anesthetized due to grayish discoloration at the margins and the poorly matched shade. 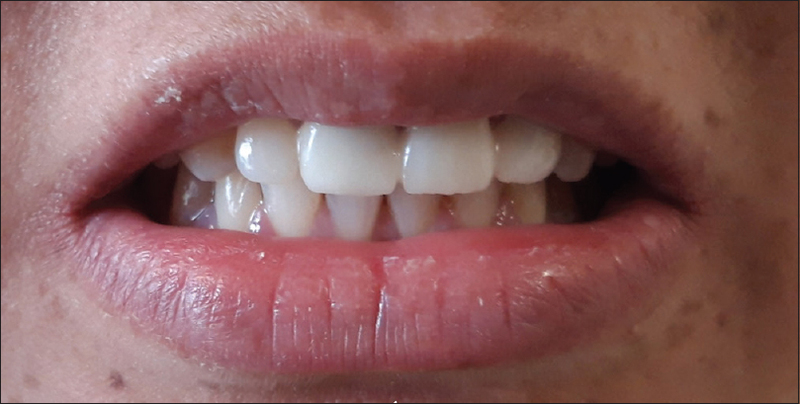 A new zirconia-based all-ceramic prosthesis was planned for this patient. A diagnostic maxillary impression was made and was poured in dental stone. The thermoplastic sheet of 1-mm thickness was vacuumed pressed on the maxillary diagnostic cast. Then, mock preparation was done for 11 and 22 and wax-up was done over it. The provisional restorations were fabricated using indirect method with tooth-colored acrylic resin (DPI) on the mock-up diagnostic cast. Tooth preparation was done for 11 and 22 to receive all-ceramic crowns [Figure 2]. The equigingival shoulder finish line was prepared for 11 and 22. The overall reduction of 2 mm and the taper of 3° on both sides were given. Incisally, 1.5–2-mm clearance was made so as to provide esthetic prosthesis. Gingival retraction was done with the retraction cord (Sure-cord). The final impression was made in elastomeric impression material with double-stage double-mix technique. The stock metal tray was loaded with putty impression material (Photosil), and impression was made with retraction cord in place and the thermoplastic sheet over the teeth. Once set thermoplastic sheet was removed from the impression. The light body impression material (Aquasil), was manipulated as per the manufacturer's instruction. Impression was loaded with light body impression material. Retraction cord was removed and light body impression material was syringed on the margins of the prepared tooth and the impression was made. Shade selection was done with the 3D-Master shade guide (VITA). 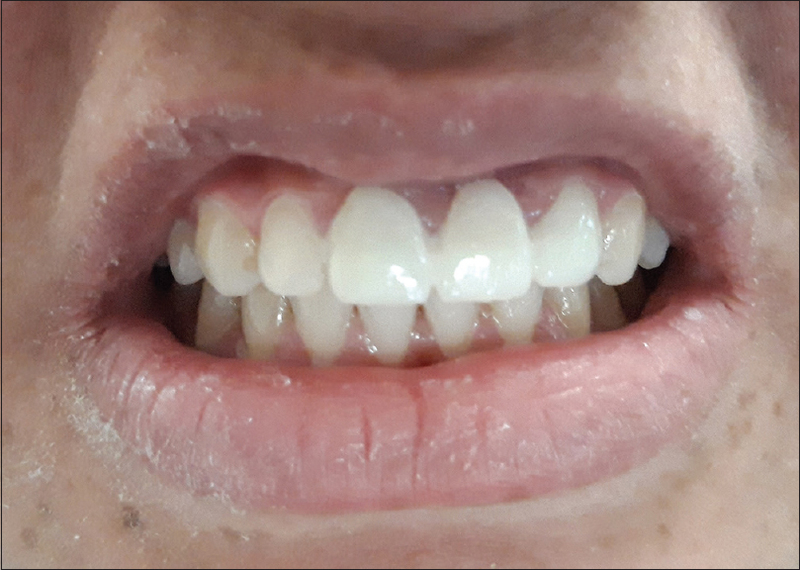 The provisional restoration was relined with the tooth-colored acrylic resin and was cemented with free eugenol temporary cement (GC) [Figure 3]. Final prosthesis was fabricated and was checked intraorally for the marginal adaptation and shade [Figure 4]. The zirconia-based all-ceramic bridge was then cemented with resin-based luting cement (Nexus RMGI, Kerr). All-ceramic restorations are the viable alternative to the metal-ceramic restoration in view of biologic, physical, and esthetic properties. Zirconia or yttrium-oxide-partially-stabilized zirconia (3Y-TZP) is a crystalline dioxide of zirconium. Zirconia is considered as a tooth-colored metal and hence fulfills both the esthetic and the mechanical properties required for the long-term success of the prosthesis. Many studies are being conducted to find the suitable luting cement for zirconia crowns. It has been found that resin-based composites are the best luting agent for the all-ceramic restoration as it improves the retention and marginal adaptation of the restoration to tooth. In this case, esthetics was the primary requirement of the patient. And hence, all-ceramic restoration was planned in this case to overcome the drawbacks of the metal-ceramic restoration. The authors would like to thank Dr. Anjali Borle, HOD and Prof., Department of Prosthodontics, Sharad Pawar Dental College and Hospital. Anusavice KJ, Shen C, Rawls HR. Phillips' Science of Dental Materials. 12th ed. St. Louis, Missouri, USA: Saunders Elsevier Inc.; 2013.
da Silva GR, Roscoe MG, Ribeiro CP, da Mota AS, Martins LR, Soares CJ, et al. Impact of rehabilitation with metal-ceramic restorations on oral health-related quality of life. Braz Dent J 2012;23:403-8. Donovan TE. Factors essential for successful all-ceramic restorations. J Am Dent Assoc 2008;139 Suppl:14S-8S. Heintze SD, Rousson V. Fracture rates of IPS empress all-ceramic crowns – A systematic review. Int J Prosthodont 2010;23:129-33. Pjetursson BE, Sailer I, Zwahlen M, Hämmerle CH. A systematic review of the survival and complication rates of all-ceramic and metal-ceramic reconstructions after an observation period of at least 3 years. Part I: Single crowns. Clin Oral Implants Res 2007;18 Suppl 3:73-85.